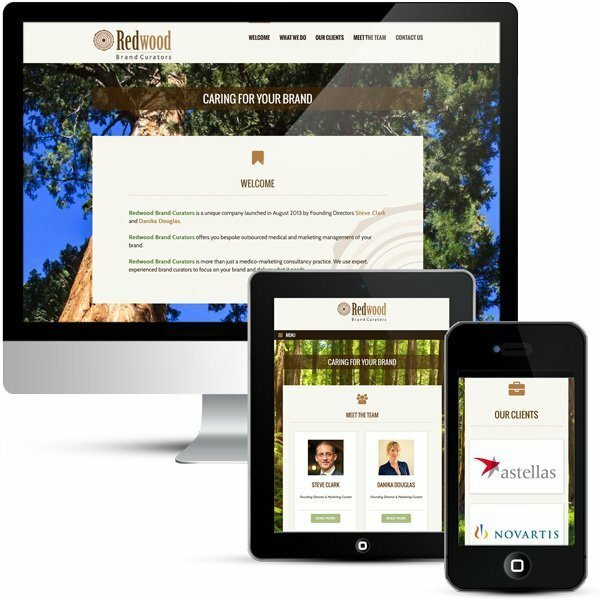 This is a custom WordPress web design for Redwood Brand Curators, a marketing agency. Marketing websites can be quite difficult to design as they do not generally have a theme. However, that was not the case here – Steve was very good that Redwood should be well represented as a brand and that meant trees! It is not too much of a challenge to find beautiful images of Redwoods and that is what I used for the background on this website. Giant redwoods – the world’s most massive trees measured by volume that can reach heights of up to 95 metres [300ft] and have a lifespan of up to 3,500 years – have been around for over 200 million years. Until about one million years ago they were widespread across the Northern Hemisphere, including Europe & Ireland. Then the the advance of the glaciers in the recent ice age left them with only one limited area of refuge on the western slopes of the Sierra Nevada mountains of California. Elsewhere in the region they died out due to moisture stress. After their discovery in 1852 there was sadly some felling of them over the next 70 years or so. This felling included in 1853 a redwood named ‘The Discovery Tree’ whose stump was used as a dance floor – see drawing below. The logo of the website had already been created and the brand needed to match with that. It includes the cross section of a tree trunk. I used part of the design as a background feature on the cream content areas. The colours – brown, green and the pale pink are also very earthy and create the required natural feel for this website.